Originally created by TV writer Sam Bobrick and developed by producer Peter Engel, Saved by the Bell (1989-93) outgrew humble origins to quickly become an enduring and popular teen sitcom -- which, at the time, was a genre that didn't exist. First envisioned as a teacher-focused series called Good Morning, Miss Bliss in 1988, it was retooled for younger audiences with a bigger spotlight on the (mostly new) students and a more fun and colorful atmosphere. Both were necessary with the show's new timeslot on NBC: Saturday mornings, where it was head-to-head against cartoons that had dominated the landscape for decades. Before Blossom, Boy Meets World, Hang Time, and more dramatic fare like Beverly Hills 90210 and Party of Five, Saved by the Bell proved that a show could survive on teenage audiences alone. Designed to mimic the ultra-colorful, quick-moving cartoons it was up against, Saved by the Bell's other big strength was the cast: lead roles were filled out by Mark-Paul Gosselaar (Zack), Dustin Diamond (Screech), Mario Lopez (Slater), Lark Voorhies (Lisa), Elizabeth Berkley (Jessie), and Tiffani-Amber Thiessen (Kelly), along with Dennis Haskins as principal Richard Belding and Ed Alonzo as Max (season 1 only), the owner of a popular restaurant where the kids hung out after school. Simply put, the cast had great chemistry from the start, and it's easy to see why: four were returning from Good Morning, Miss Bliss and the kids all were at or near the ages they were portraying, so they got their own high school educations when the cameras weren't rolling. The close-knit bond this type of formula made, plus the smart decision to move on after four seasons (more on that later), created that kind of lighting-in-a-bottle appeal that gave Saved by the Bell so much staying power. Call it corny, repetitive, or even Friends, Jr., but it's still popular today. All four seasons of Saved by the Bell were originally released on DVD by Lionsgate beginning in 2003, as well as a later boxed set plus separate releases of The College Years and two made-for-TV movies, Hawaiian Style and Wedding in Las Vegas. Shout Factory's new Complete Collection aims to improve that situation: it likewise collects all four seasons (and presents them in a more correct order than the previous DVDs), throws in The College Years and both movies, plus we get the DVD debut of Good Morning, Miss Bliss and a few new bonus features to boot. It's a solid package and priced to move, even if a few technical problems keep this from being a truly definitive release...and if it sells well enough, we might get a separate release of the long-running spin-off Saved by the Bell: The New Class (1993-2000). For now, let's do a quick run-through of the included shows and seasons, follow by a more technical overview of the disc material. Good Morning, Miss Bliss (2 discs, 1988-89) was produced by NBC and originally aired on The Disney Channel. Then-president of NBC Brandon Tartikoff suggested the idea based on his beloved sixth-grade teacher; former Disney child star Hayley Mills (The Parent Trap) was cast in the title role, a similarly inspiring teacher and the show's main focus. During its first and only 13-episode season, it also featured young students Zack Morris (Mark-Paul Gosselaar), Samuel "Screech" Powers (Dustin Diamond), Lisa Turtle (Lark Voorhies) in addition to Mikey Gonzalez (Max Battimo) and Nikki Coleman (Heather Hopper), not to mention principal Richard Belding (Dennis Haskins). If you're viewing it now for the first time, Good Morning, Miss Bliss will likely seem like a dated relic but is still worth a once-over to see where it all began. Though appealing in hindsight for its focus on adult perspectives, the show seemed too derivative of other sitcoms from the era. Good Morning, Miss Bliss may not have been renewed...but obviously, our story doesn't end there. 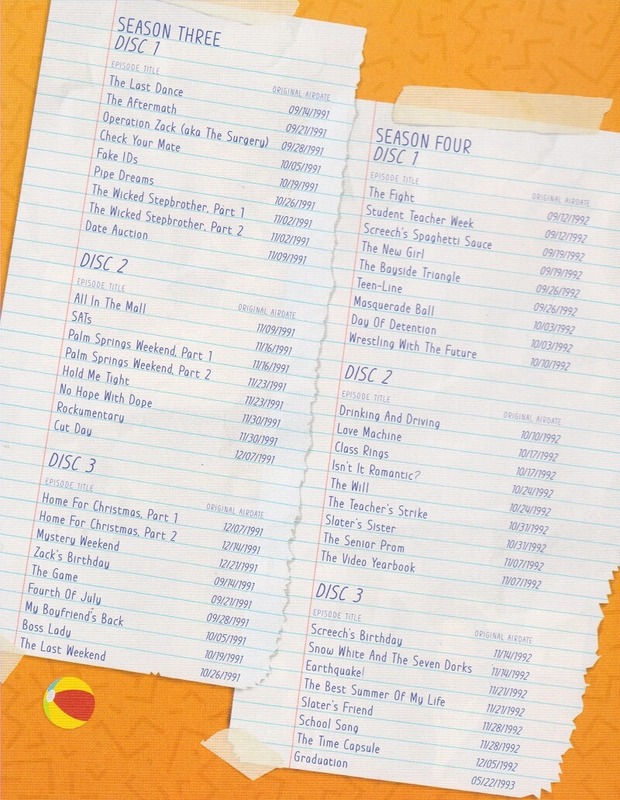 Reviewer's note: Instead of the original Good Morning, Miss Bliss opening (which can be seen here), these 13 episodes feature Saved by the Bell title cards with the younger cast and "flashback" intros created for its syndication run, where it was known as Saved by the Bell: The Junior High Years. 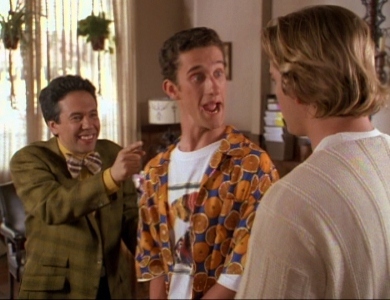 Its earlier 1987 pilot, featuring a totally different cast of students including Brian Austin Green, Jaleel White, and the late Jonathan Brandis, is also not included due to rights issues. This pilot was only aired once but again, thanks to YouTube, you can watch that too. Shout out to Peter Bonerz! Saved by the Bell, Seasons 1 and 2 (4 discs, 1989-90) begin the series proper, immediately introducing all six "official" leads and establishing the formula and atmosphere that would continue during most of the series. Typical episodes were budgeted at around $300,000 and completed start-to-finish in just five days: from table reads to shooting in front of a live audience, the quick turnaround time kept things hectic and constantly changing despite the familiar formula. Even at just 34 episodes between them, a lot of now-classic episodes are here: "Jessie's Song" (the one with the caffeine pills), of course, but also "The Gift" (Screech can predict the future after being struck by lighting), "Aloha Slater" (Zack tries to get rid of his rival in order to win Kelly's heart), "The Substitute" (Kelly, Lisa, and Jessie fawn over substitute teacher Mr. Crane, much to the boys' chagrin), "Pinned to the Mat" (Screech subs for Slater for a particularly big wrestling match), "The Mamas and the Papas" (the boys and girls are paired off as married couples for a class assignment), "The Prom" (Zack tries to give Kelly a night out after getting bad news from her father), "Save the Max" (the kids' favorite hangout almost closes down, and we get a great flashback of Mr. Belding as a radio host), and "The Fabulous Belding Boys" (the principal's much cooler brother Rod wins over the students, but ultimately leaves them hanging). Behind the scenes, the first seven episodes were almost the last: Saved by the Bell was given a limited tryout as one of the few live-action shows aimed at Saturday morning kids -- and it didn't help that the first two episodes, "Dancing to the Max" and "The Lisa Card", aren't very good. Either way, it suffered in almost every demographic except for one: 12 to 17-year-olds (particularly females), where it dominated almost immediately. Instead of cancellation looming on the horizon, more than a dozen new episodes were ordered. The show's popularity would only strengthen with the teenage crowd as it rolled into season 2, where it would compete with top-rated family dramas of the era like The Cosby Show. Saved by the Bell, Seasons 3 and 4 (6 discs, 1991-93) is where the series was pushed into bigger territory all around: new episodes were frequently aired back-to-back on Saturday mornings, with at least one each week often presenting an adventure outside the school (a clever cost-saving trick made possible by using soon-to-be discarded sets of completed movies and TV shows). Not surprisingly, there are more overall episodes here -- more than 50 between both seasons -- and no shortage of classics like "The Last Dance" (Kelly starts working at the Max and falls for her new boss), "All in the Mall" (the kids are chased by gangster after finding stolen money at the mall), "No Hope with Dope" (an anti-drug PSA shot at Bayside turns fun sour when the star is found to be a pot smoker), "Rockumentary" (the fictional history of Zack Attack's rise to fame, hosted by Casey Kasem), "Mystery Weekend" (a bizarre Clue-inspired murder mystery where Zack is suspected to be the killer), "Student Teacher Week" (kids and teachers switch places, leaving Zack as principal), "Snow White and the Seven Dorks" (word to yo' mutha! ), "The Time Capsule" (one of the least offensive "clip shows" in history), and series finale "Graduation" (which, incidentally, first aired on a Saturday night). 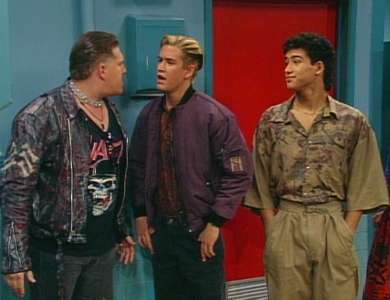 A note about the episode order for Saved by the Bell - from Shout Factory's official website: Like many television series, the order in which Saved by the Bell's episodes were produced does not necessarily reflect the order in which they were aired. Consequently, some episodes aired noticeably out of sequence in terms of depicting the ages and shifting relationships between the characters. 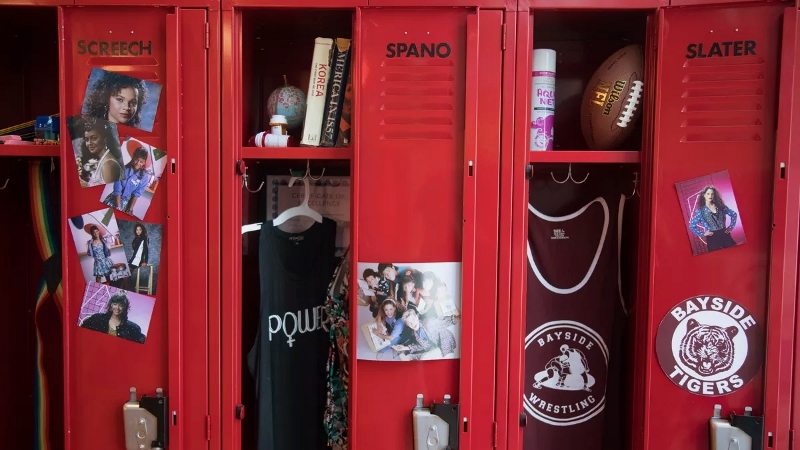 This is particularly pronounced in Season Three, when Saved by the Bell began airing two episodes a week - usually a school-based episode followed by an "adventure" episode which saw the gang journey beyond the halls of Bayside. In spite of these anomalies, we have attempted to present the episodes in airing order with the notable exception of the "Malibu Sands" story arc, which is presented in sequence here at the end of Season Three, in order to best serve the viewing experience for fans. Executive Producer Peter Engel was consulted on this matter, and he approved our decision to present the episodes in this manner. So, there you have it. Saved by the Bell: The College Years (2 discs, 1993-94), much like Good Morning, Miss Bliss, is a failed bookend to the main series. Set just after high school graduation, The College Years' biggest mistake is shifting towards a more dramatic, soap-opera tone -- perhaps due to the popularity of new shows like 90210 and Melrose Place -- and initially dropping most of the female cast. Lark Voorhies fared the worst (especially since she was in it from the start) and Elizabeth Berkley was still gone, but Tiffani-Amber Thessen returned as Kelly after The College Years' pilot, replacing new character Danielle Marks (Essence Atkins). 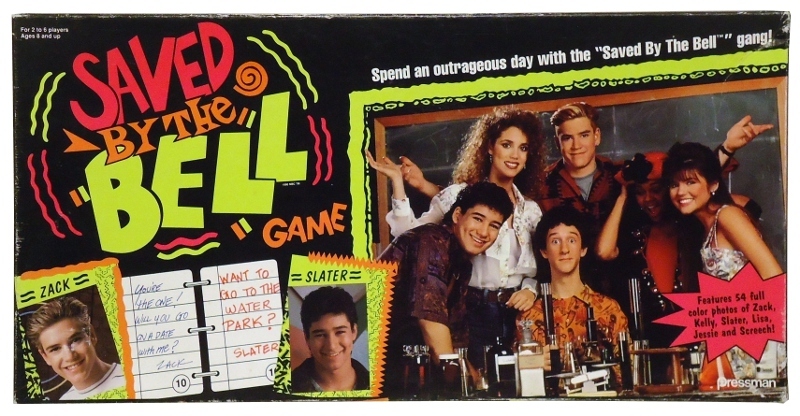 For the most part, though, this was a boys club: Zack, Screech, and Slater were the main focus, along with newbies Leslie Burke (Anne Tremko) and Alex Tabor (Kiersten Warren). Despite four of the six cast members remaining the same, The College Years' reliance on drama over lightweight comedy rubbed viewers the wrong way: it was cancelled after a single season of 19 episodes. We do get a few decent guest stars along the way, including Dennis Haskins (as Mr. Belding, natch), Ed Winter (M*A*S*H), Marv Albert, Jonathan Brandis and Brian Austin Green (from the first Bliss pilot, remember? ), Jenna Von Oy, Robert Guillaume and, hey, Lark Voorhies (as Lisa). Hawaiian Style and Wedding in Las Vegas (1 disc, 1992/94) are two made-for-TV movies that round out the set. The former, likewise shot before the main series' finale and intended as a summer vacation story between the kids' junior and senior years, feels a lot more familiar but ends up falling flat. It sounds OK on paper, kind of: Kelly invites the crew to spend the summer at a Hawaiian hotel owned by her grandpa (Dean Jones), but pap-pap's having unexpected financial problems because of rival tycoon Charles Worthington (Victor Brandt). Meanwhile, Mr. Belding is in the area hosting a group of principals from California. It's OK at times and worth a once-over, but not an essential part of the series. Surprisingly, Wedding in Las Vegas turns out to be a decent send-off: it's essentially the series finale of The College Years and "Generation 1" as a whole, and one that provides some closure by getting the old cast back together. Lovebirds Zack and Kelly head for Vegas on a whim with only $1,200 between them, so Slater, Screech, Lisa, and Jessie join them as two separate groups. Not surprisingly, this road movie features plenty of detours that don't always serve the main plot...but for the most part, it feels like a decent finale that captures some of the original series' magic. Presented in their original 1.33:1 aspect ratios, the masters for these episodes were supplied by NBC and don't look to be in the best condition. 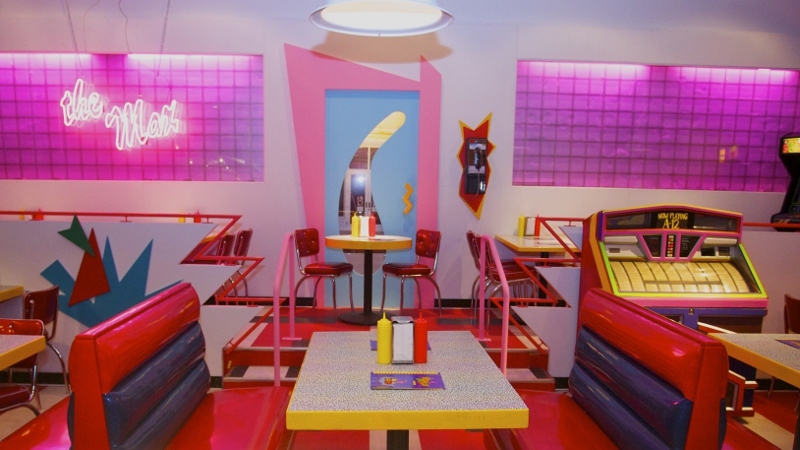 To be fair, Saved by the Bell was shot and edited on videotape and, as such, will never look as good as film. But even within those obvious boundaries, these standard definition transfers don't look any better than those on the old Lionsgate discs: colors are somewhat dull (considering the show's heavily saturated visual design, of course), black levels are generally weak, and overall image detail isn't far beyond a decent-quality broadcast signal. Compression issues don't seem to be an issue, although I noticed some rather obvious interlacing issues on both Hawaiian Style and Wedding in Las Vegas -- not sure if it was present on the previous disc(s), but it's rather distracting at times. Overall, though, it's hard to be all that disappointed even if the video quality could be improved: Saved by the Bell has always looked like this, and unless it underwent the recent scanning process used by Sony for Fraggle Rock and Criterion for the re-issue of Hoop Dreams (both recent Blu-ray releases), Saved by the Bell will be stuck in this realm for awhile. DISCLAIMER: The still images and screen captures on this page are decorative and do not all represent the title under review. The audio sounds a bit more satisfying overall, as each episode is presented in its standard Dolby Digital 2.0 mix with well-balanced dialogue, laugh tracks, and music. No obvious hiss, pops, drop-outs, or sync issues were detected during the episodes and bonus content I sampled, although I did notice a faint echo on the overall mix -- this didn't prove to be distracting and, as far as I know, doesn't indicate a defect. Sadly, no optional English SDH subtitles have been included for these episodes, which should be absolutely required on mainstream home video releases at this point. The colorful and simple interfaces for each disc keep sub-menus to a minimum and provide easy, trouble-free navigation with minimal logos and other pre-menu distractions. Each of these 16 discs contains roughly 3-4 hours of total content and, unlike the old Lionsgate discs, include multiple chapter stops (usually during commercial breaks). This 16-disc set is housed in four standard-width keepcases containing two to six discs each, along with attractive dual-sided artwork with episode lists repurposed above. A separate Booklet includes notes, episode summaries, and more, while everything is tucked inside a sturdy outer slipcase. Unfortunately, Shout Factory got a little cheap with those four plastic keepcases: the hinges and hubs are extremely prone to breakage, so be careful if you're ordering this online. Two brand-new retrospective documentaries have been created exclusively for this DVD collection. The first is "Past Times at Bayside High" (51:45), which covers a lot of ground including the show's initial development and first year as Good Morning Miss Bliss, retooling their formula the following year, assembling the "official" cast, competing against Saturday morning cartoons, the writing process, Saved by the Bell's visual style, finishing each episode in just five days, working in front of a live studio audience, rebounding in the ratings (thanks to the 12-17 female demographic), tidal waves of fan mail, knocking out seven storylines in a one-hour meeting, trading speed for caffeine pills, being nominated for Humanitas prize in 1991, graduation, The College Years, and beyond. 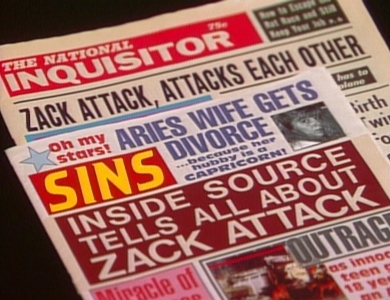 It features new interviews with executive producer Peter Engle, producer Franco Bario, writer/producers Tom Tenowich and Bennett Tramer, actors Lark Voorhies, Ed Alonzo, and others. While a few stories are repeated from earlier bonus features, this is a fun piece overall with lots of insightful comments, behind-the-scenes photos, and a visual design that matches the show's extremely colorful aesthetic. Also new is "Bayside's Greatest Hits" (4:45), a much less in-depth but still highly enjoyable retrospective about the show's music. Featuring interviews with songwriter/composer Scott Gale and composer Rich Eames, topics of discussion include writing the theme song in two minutes after going through a divorce (! ), recording a quick demo, incidental music, a shout-out from Lin-Manuel Miranda, learning new instruments, the musical episodes, and more. It's a fun little piece that definitely could have gone on a lot longer, especially since the music was rarely discussed elsewhere. The remaining supplements, for the most part, are ported over from Lionsgate's 2013 Complete Collection and other DVD releases. These recycled extras include mid-length featurettes "Saturday Morning: From Toons to Teens" (10:28), "It's Alright: Back to the Bell" (16:57), "The First Of Its Class: From Sit-Com To Icon" (14:44), three separate Photo Galleries of behind-the-scenes stills, and Audio Commentaries with executive producer Peter Engel, Dustin Diamond, Dennis Haskins, and Lark Voorhies during "All In the Mall", "No Hope With Dope", "The Last Weekend", and "Zack's Birthday". Surprisingly enough, a few new commentaries are on here too; these collectively feature pop culture historian Richard Dyball, podcast host Tara Wibrew, and Shout Factory DVD producer Henry Weintraub during "Dancing to the Max", "Jessie's Song", "Snow White and the Seven Dorks", and "Graduation". Again, while the lack of input from other primary cast members on the old and new extras is still disappointing, what's here should be a lot of fun for die-hard fans to dig through. Serving up over 100 episodes from three different series and two made-for-TV movies, Shout Factory's Saved by the Bell: The Complete Collection is a thorough package that, aside from a few small omissions, should satisfy casual and die-hard fans alike. Beginning with Good Morning, Miss Bliss and beyond The College Years, this 16-disc set charts a clear path that smartly stops before the franchise moved on to The New Class. But most people are just here for the main four-season title series -- and even if you don't watch all that other stuff more than once, you'll get your money's worth: there are a lot of classic episodes here (some unintentionally so), and even the less impressive outings contain the same "watchability" factor that kept Saved by the Bell in pop culture history through recent years. Although the A/V presentation is nothing to write home about (partially due to its videotaped origins), the new bonus features are more than welcome and the "new and improved" episode order is also appreciated. It's a steal at less than $50 as of this review...so unless you're happy with the Lionsgate discs or streaming on Hulu, this one's worth picking up. Highly Recommended.